Use the toolbar on the side to narrow down your search. If you do not see what you are looking for, we have hundreds of stock items. Please send a request with the label information to contact or call 1-800-875-6411. Generally, all stock labels have Permanent Acrylic Adhesives, and all roll labels are wound out and on 3” Cores, unless otherwise specified. 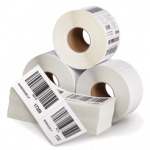 Paper Labels: Premium coated bright white matte finish paper, provides smudge resistant face for excellent print quality. Paper Tags: 7 mil standard thickness, premium coated ultra smooth bright white matted finish paper tag stock, provides smudge resistant face for excellent print quality. Other thicknesses available. Flood Coated Paper Labels: Face tinted, premium coated matte finish paper, provides smudge resistant face for excellent print quality. Fan Folded Paper Labels: Premium coated bright white matte finish paper, provides smudge resistant face for excellent print quality. Kimdura® Labels or BOPP: White Biaxially Oriented Polypropylene, recommended for high degree of durability. Withstands a wide range of environmental conditions including water, oil, dirt, alcohol and blood. Polyester Labels: Glossy white 2 mil Polyester, for toughest indoor and outdoor applications, including circuit boards. Excellent resistance to Oil, dirt, alcohol, blood and water, UL recognized. Eagle Wright © 2018. All Rights Reserved.